The Apollo Dynamic mattress system is a 2 cell alternating full mattress replacement system. Designed for users at high risk of pressure sores. Automatic adjustment feature -determined by patient weight and positioning. Head cells are static for patient comfort. Anti slip base to reduce the risk of movement. Visable and audible alarms for cases of cycle fault, low pressure and power failure. Two way stretch, waterproof/vapour permeable top cover with concealed zips. 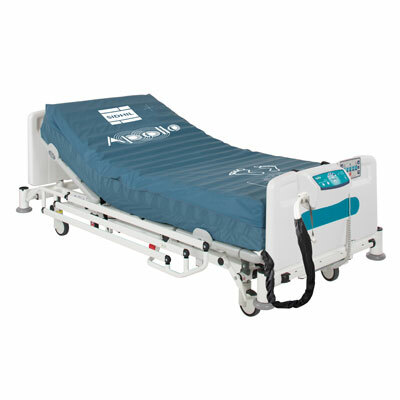 Rapid deflate CPR function with easy to use transport function- the mattress will stay inflated for up to 12 hours.